So, you’ve selected or purchased the perfect new faucet for your home. You are now wondering whether to have a professional install it or whether you think you are capabable of installing it yourself. It's easy if you follow the general instructions and have the proper installation tools. 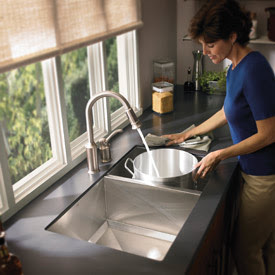 If you’re ready and eager to install your own faucet, we offer these helpful hints from our Featured Partner Delta Faucet. If you have not done this before, we suggest that you read the general installation tips below. For instructions on installing your specific faucet, please follow the Maintenance and Installation instructions that were provided with your faucet. If you are not comfortable installing your own faucet purchased online, you may want to rely upon the services of a professional plumber? The best deals on Faucets are from top online authorized dealers like eFaucets.com who offer top brands like Delta Faucets. They offer Free Same Day Shipping*, Largest Selection, Lowest Prices and Excellent Customer Service. For expert faucet installation once your faucet arrives, you should contact a licensed professional plumbing contractor in your area. These faucet installation instructions are general instructions for both Kitchen Faucets and Bathroom Faucets. Water is typically supplied to the faucet through water-supply tubes. From under the sink, make sure the pivot-rod is in the down position. Insert the lift-rod into the lift-rod strap. Tighten the screw. Make any needed adjustments by loosening the lift-rod strap screw and repositioning the lift-rod. If you need to connect the lift-rod strap to the pivot rod, slide one end of the spring clip onto the pivot-rod. Make sure that both the pivot -rod and the lift-rod are in the down posittion. Insert the pivot-rod in the closest hole in the lift-rod strap. Slide the other end of the pivot-rod. Make sure the lift-rod opens and closes the drain plug as desired. Make major adjustments by removing the spring clip and moving the pivot-rod to a different hole in the lift-rod strap. Anytime you work on plumbing, filings, chips, and other debris can fall into the plumbing pipes. This debris can damage the sealing surfaces inside the faucet and cause leaks. Close the faucet handles (turn off). 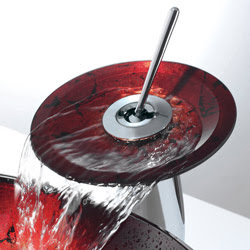 Style and superior craftsmanship – the Glass Waterfall faucets from Kraus have both of these in spades. 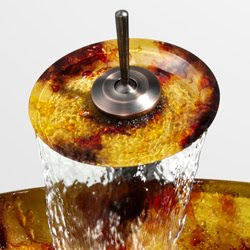 Kraus Faucets has been making a name for itself with its fine bathroom and kitchen fixtures that feature amazing innovative designs with an clear eye towards high quality construction, and you will find that the Kraus Glass Waterfall faucets not only look great, but will last you for many years to come. Crafted from solid brass, the main section of the faucet is durable, sturdy and definitely built to last. It will stand up to all of the rigors of daily use and still come out looking like a champ year after year. 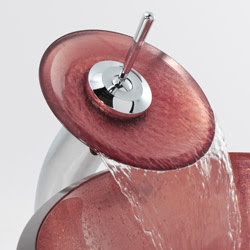 The Glass Waterfall faucets are members of Kraus’ Premium Bathroom Faucet Collection. 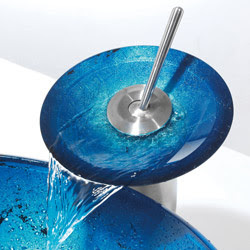 They feature a glass disc at the top that allows the water to flow over and fan out, creating the illusion of a waterfall right there in your bathroom. The glass discs come in a range of different colors – like clear glass and a striking translucent black – and the metal of the faucets comes in an even wider range of finishes – polished gold, satin nickel, chrome, brushed chrome, antique brass, oil rubbed brass and antique copper. With such an array of choices as far as color schemes, you’ll have no trouble working this faucet into your existing décor or building a whole new design around it. The faucets are single hole installation types, and also single lever operated. This means that both the hot and cold water controls are operated by a single lever. It is a convenient feature, and also makes this type of faucet ideal for anyone with small children or disabled persons living with them, since ease of use is built right in. 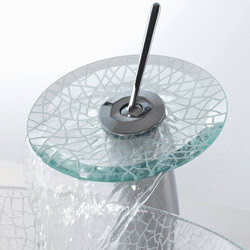 The Kraus Glass Waterfall faucets are suitable for use with vessel sinks or basin sinks, and you’ll love the touch of class and grace they add to your bathroom. 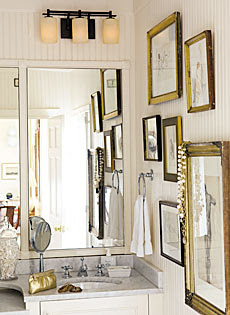 When considering the lighting plan for your bathroom, consider complimenting your choices with mirrors. Mirrors can make a space look larger and lighter; they can increase the impact of anything they reflect; they can change the contours of a room; and multiply and divide the effects of light. The lighting fixture to the right is part of the Stowe Collection. Another way to add sparkle is with a chandelier. The chandelier originated as a device to hold multiple candles, basically introducing more light when each individual source was of limited power. Over time, refinements were added to chandeliers, such as tiers of cut glass and crystal, primarily for the practical purpose of fracturing and multiplying the light further. Chandeliers can add these reflective properties to the bathroom creating depth and drama. Lighting has all of your Hinkley Lighting needs. LightingCatalog.com is an online leader of Hinkley Outdoor Lighting and Hinkley Landscape Lighting. We are a sister site of eFaucet.com and a member of the eImprovement.com Network of Online Stores. Get your perfect bathroom lighting to match the faucets you purchase from eFaucets.com. Free Ground Shipping on all orders over $99. Large selection, low prices and excellent customer service. The Home Lighting and Outdoor Lighting leader. Why shop elsewhere? Moen answers the need for sleek, modern styling in the kitchen and bath with the new Moen 90°™ collection. Featuring a minimalist design, the suite offers geometric, 90-degree-angled lines – all engineered with the most sophisticated Moen technology. The Moen 90° bath collection stands apart with its clean, geometric lines and a unique waterfall presentation to accentuate the look of any modern bath. Available in a Chrome finish, the faucets make a bold statement in both a single-handle, single-hole mount (with optional vessel extension to accommodate vessel sink applications); as well as a two-handle widespread style. In addition to its unique styling, all of the single-handle faucets in the collection feature Moen’s new 1255™ Duralast™ cartridge. This new, state-of-the-art ceramic-disc cartridge is just another example of how Moen continues to lead the faucet industry in innovation. The compact cartridge allows for exceptional design, while providing the consistently smooth handle feel and the highest levels of quality and durability for the life of the faucet. The 90° suite utilizes Moen’s innovative M-PACT® valve system on its eight-inch widespread faucet, showering options and the three- or four-hole Roman tub faucets. This revolutionary valve architecture makes it quick and easy to change the style of the bath without replacing any faucet plumbing. The allure of the 90° bathroom faucets is not limited to style and installation benefits, however. Each lavatory faucet has been certified to meet WaterSense® criteria, meaning the fixtures meet the Environmental Protection Agency’s (EPA) guidelines as an environmentally responsible and efficient product. Each new lavatory faucet is flow-optimized and allows water to flow at 1.5 gallons per minute (gpm), versus traditional aerators that flow at 2.2 gpm. This provides consumers the sensational water experience they are accustomed to, while reducing water usage by up to 32 percent. And for developers, these water-efficient products contribute towards maximizing LEED® (Leadership in Energy and Environmental Design) points. 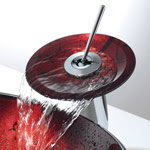 eFaucets.com is the leading online retailer of Faucets. We carry every Moen product including Moen Faucets, and Moen Sinks. Free Ground Shipping on all orders over $99. Award winning site, large selection, low prices and excellent customer service. The Faucet leader. Why shop elsewhere? If maintained properly, your stainless steel sink will not chip, peel, rust or discolor. The following chart illustrates recommendations for maintaining the original appearance of your new Moen® stainless steel kitchen sink. By following these suggestions, your sink will look great and be worry-free for many years to come. Soap, ammonia, detergent and water. Rub with a sponge or cloth. Rinse with clean water and dry. Satisfactory for all finish types. Rub with cloth. Satisfactory for all finish types. Apply with sponge or cloth. Rub back and forth in direction of grain lines. Rinse with clean water and dry. NOTE: Not for mirror finishes. Swab and soak for 5-10 minutes. Rub, then rinse with a neutralizer (such as a baking soda solution). Rinse with clean water and dry. Satisfactory for all finish types. Swab with a cloth and soak for 5 minutes. If necessary, rub with a nylon pad. Rinse with clean water and dry. Satisfactory for all finish types. Steel wool pads to clean your sink. This can cause rust or pitting of the sink surface. Avoid leaving rubber mats, wet sponges, cloths and cleaning pads to sit in the sink. Food particles and deposits can cause discoloration. Avoid leaving liquid soap to dry on the sink surface. Many detergents contain chemicals that can dull the finish, cause pitting or staining. Avoid using bleach in your sink. Bleach, even dilluted, can cause corrosion if left in your sink for extended periods of time. If bleach comes in contact with your sink, rinse thoroughly. Water quality can also affect the appearance of your sink. Where hard water or water with high iron content is present, a brown stain, looking like rust, may appear. In areas with water of a high concentration of minerals or oversoftened water, a white film may appear on the sink. If either condition exists, we recommend drying the sink with a soft towel after each use. A luxury experience - just a touch away. ioDIGITAL, by Moen, makes creating a truly personalized shower or bath simple. One you achieve your preferred combination of temperature and water delivery, you can re-create that exact experience any time you desire with the touch of one button. Luxury is literally at your fingertips. View the video below of a demo of how this amazing digital shower system operates. ioDigital is proof that advancements in technology dont have to be intimidating or overly complicated. With intuitive controls and simple operation, Moen made ioDigital as easy as it is innovative. ioDigital will tell you everthing you need to know - before you get in and get wet. The intelligent controller provides quick, visual feedback - LED indicators flash until your requested settings are achieved. The LED gauges will even alert you if your hot water supply happens to run low. All it takes is a glance. Think of it as love at first sight. One of the greatest advantages of ioDigital digital technology is the ability to program your preferred settings into memory. With flexibility to store up to four different presets, you can get the exact bath or shower experience you want again and again with the touch of just one button from the controller or remote control. Nothing could be easier. With each LED on the temperature gauge representing a narrow 3°F range, ioDigital allows you to dial in the precise temperature you desire. Plus, the flow rate system locks in your settings electronically. Even if water is turned on in other parts of your house, you won't have a noticeable fluctuation in water temperature or delivery. The Moen ioDigital Technology comes in three systems. The Moen Vertical Spa, Moen ioDigital Shower and Moen ioDigital Roman Tub. Kaldewei, Europe's No. 1 for Baths, has taken the U.S. luxury bath market by storm in 2009. 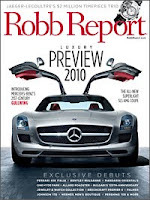 Kaldewei Baths are luxury enough for the affluent market that they were just featured in Robb Report. The magazine aims to be the ultimate authority on the lifestyle that encapsulates all the elements of luxurious living. The Kaldewei LUXXO DUO OVAL (below right) and the Kaldewei BASSINO (above left) are featured in the October issue of Robb Report magazine in The Robb Report Collection product guide. The Kaldewei LUXXO DUO OVAL and BASSINO bath tubs are featured in the Design Guide section of this issue in a story on new tubs and saunas for the home. Other products included in the section are the Morphosis soaking tub from Jacuzzi, Sunlight Saunas, and the Victoria & Albert ios tub. 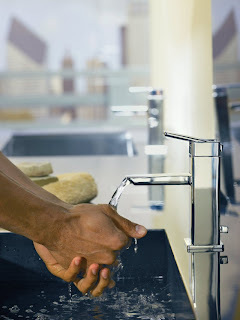 eFaucets.com was the first online retailer to bring Kaldewei Baths online as eFaucets.com is the largest online retailer of faucets, bath fixtures and accessories for the Kitchen and Bath. 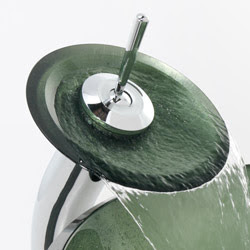 Shop eFaucets.com for the entire line of Kaldewei tubs and faucets at great prices. Why shop anywhere else?